An import permit is a document issued by a national government authorizing the importation of certain goods into its territory. A government may put certain restrictions on what is imported. This can be to reduce the risk of disease or to monitor the import of restricted or dangerous material. It is the customer’s responsibility to provide the relevant import permit and/or supporting documentation in order to facilitate shipping biological materials to a restricted country. Please check that the permit is still valid, with at least 30 days remaining until expiration. Customers in Australia and New Zealand must submit a permit for every order. After placing your order, please email your permit to [email protected] and include your Addgene order number. Don't see your country here? Review our international ordering page. These forms are for guidance and illustration purposes only. Addgene is not, and does not represent to be, acting in any official capacity on behalf of, or for, the [country] government. Accordingly, users should consult their official permitting office as these forms are subject to change and Addgene's examples may not reflect the forms currently in use. Australia requires an AQIS (Australian Quarantine and Inspection Service) permit to import biological materials. A PDF copy of this permit, with your order number, must be sent to Addgene by e-mail ([email protected]) for each order of materials for Australia. Consult your purchasing or shipping department at your institute, as your lab may already have a valid import permit. Click here for information on applying for a new AQIS permit. For plasmids shipped as bacterial stabs (the majority of Addgene’s collection), your AQIS permit must include at least one condition allowing for the import of Escherichia spp/ E. coli and/or bacterial plasmids . Please note that conditions specifying purified genetic material will not allow for the import of bacterial stabs. LMO approval may be needed to import viral vectors into the country. We can keep your order on hold until approval is completed on your end. A copy of this documentation is not needed by Addgene, but should be available to expedite customs in Korea. 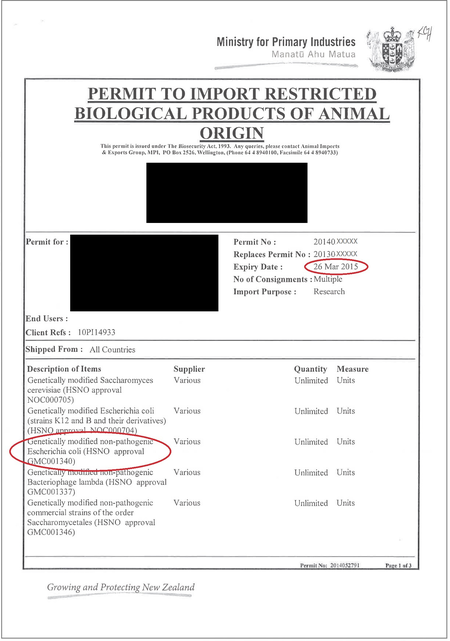 New Zealand requires the “Permit to Import Restricted Biological Products of Animal Origin” permit to import biological materials. A PDF copy of this permit, with your order number, must be sent to Addgene by e-mail ([email protected]) for each order of materials for New Zealand (NZ). Click here for information on applying for a new NZ permit. 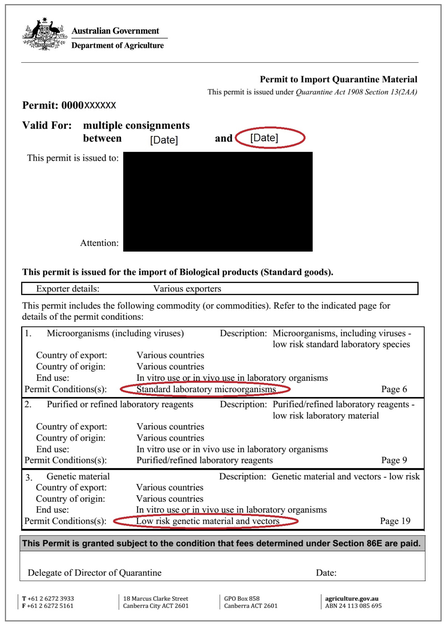 For plasmids shipped as bacterial stabs (the majority of Addgene’s collection), your NZ permit must include at least one condition allowing for the import of Escherichia spp/E. coli and/or bacterial plasmids (Valid conditions include “genetically modified non-pathogenic Escherichia coli” [HSNO approval GMC001340] and others). Please note that conditions specifying purified genetic material will not allow for the import of bacterial stabs. For pooled libraries, purified genetic material conditions will apply. To ensure minimal customs delays we would like to include the VAX (VAT exemption form) with each viral vector shipment. A copy of this form must be sent to Addgene by e-mail ([email protected]) for each order of viral vectors. Please note that there may be duties applied by local customs upon receipt. Please be sure to respond to requests as soon as possible to avoid delays in transit.